Writing this, I'm excited to have my new iPhone actually in my hands! Eek! Does the thought of changing your phone over send you into a panic? 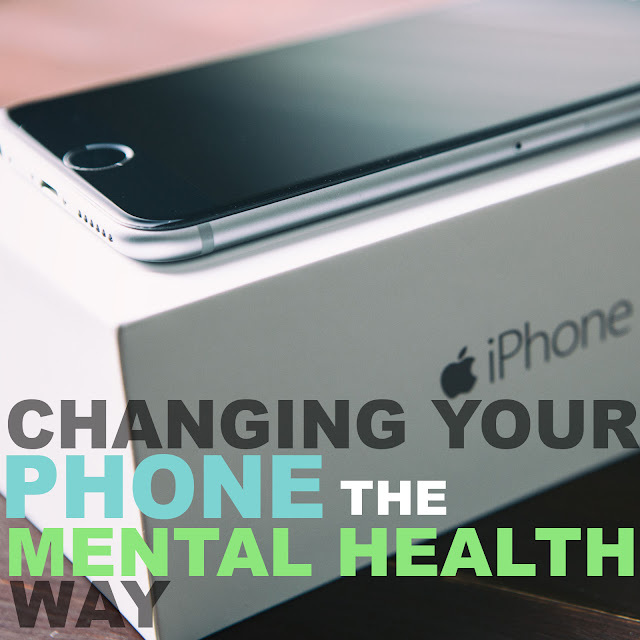 However, there is definitely an ordeal that comes with changing your phone, particularly when you suffer from depression - like me! - and your phone can quite literally be your life line. Gone are the days when all you had to worry about was changing over your phone numbers/contacts - although that was a major hassle, especially when you have to push some buttons two or three times to get the correct character, then inevitably go too far and have to go around again. No, now I'm confronted with the desire to hide, delete and remove all my information before trading in my old phone. I don't want you to know the help lines, support groups and conversations I've had when I have felt at my worst. The messages that were exchanged when I was considering self harm, the messages that went to the satellite and back about my experiences and struggles. Something I struggle with is trusting people and letting them in. So to hand over my phone is something I tried not to overthink too much. I made sure I deleted all my profiles and accounts, then the apps, then my iCloud and then reset the phone. This took a little while. I mean really how often do you look at your phone and realise how many applications you are regularly using or logged in to? For me, I don't think I'd really thought about it until I changed my phone. Particularly this time as I am much more sensitive about - not necessarily my data, but - my messages. I had about 36 hours on an old phone that allowed me to check social media briefly and was just used as a 'phone' really. It was strange. I'm so used to having a phone at my side all or most of the time. When I went to the toilet without my phone I was thinking so... what do I do in here? Then there's the morning alarm, my old phone dies after about 5 hours so I had to use my iPad for an alarm. That got me out of bed, even if it was only to the floor. That can be dangerous though. With my mental health challenges, I have taken to resting on the floor on occasion (sometimes I just can't move). So being there isn't, on its own going to make me get up. I've started to upload my apps, I never restore my phone. I like to start a new. Yes, I know I'm mainly downloading the same stuff. But it's small changes that I like. I think that's probably linked to not wanting to commit to something or it could just be me over thinking again. I can also be really picky about where the apps are. I try to group them, not necessarily in a folder though. I can have a group of social media apps, I want those together (apart from the ones on my tap bar). I also group news, media and exercise, although I'm thinking news can go in a folder. This time I have stayed on the same number, that is because I am on a no contract pay monthly with giffgaff. Their service has been great, I've had no problems with anything. I get more minutes than I'm ever going to use, text messages - what are they?! - and 1GB of data which I use about 80-95% of each month. I traded my previous handset in with Carphone Warehouse which covered just over half the price of my new phone. This all basically means I get to carry on paying just £10 per month and not £40-£55. I'm hoping I don't have to go back to that again. While I have kept my number I really would not mind losing it and changing. I don't feel 'married' to my number. Maybe read one ofmy older blog posts to see why that wording is so significant for me. This change came at a time when I really wanted and felt I needed my phone. I'm pleased the phone change over ordeal is over, well the hard bit. I'm still adding and syncing things. One of the reasons I've changed my phone is because I was all out of memory on the last one. I need more space with blogging and podcasting and the 16GB was just not cutting it. Though, no complaints here as it was a prize I won through Match.com. A prize I was flipping stoked about. I just couldn't last on that memory. So thanks to Match for not just 9 months with my iPhone 6s, but essentially paying for half of my iPhone 7. I look forward to writing and recording many more posts and episodes for you on this phone...well, for the next year at least. Does it make you avoid updating your phone because of the lengthy process?